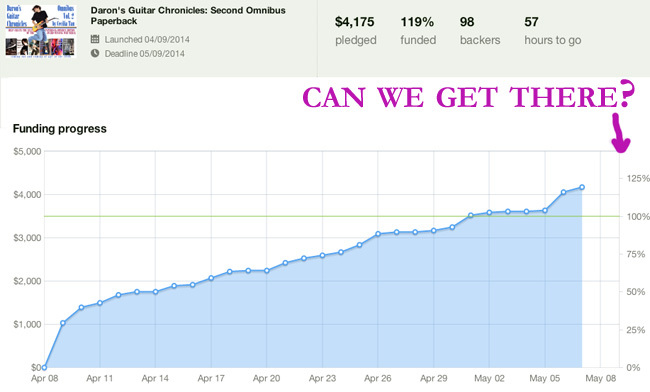 Kickstarter for Daron’s Guitar Chronicles ends Friday! Only two days left on the Kickstarter to produce a paperback omnibus of my web serial! Two years ago we did one to print chapters 1-200. Now it’s time to do another 200 or so chapters! The campaign has been going great. We made the minimum goal last week and in the last 48 hours before it all ends at noon on Friday (May 9), the question is can we get to the stretch goals? Tuesday the $4,000 goal was reached and we’re only $200 from the goal at $4,500. Even better would be to get all the way to $5,000 which would win backstage passes for all backers, produce not only the omnibus but also individual paperbacks of all the ebook volumes, and give all backers all the bonus digital rewards! 20 Hours left! And only $439 left to raise! Ahhhhhhhh!!!!!1!! !